Almost a decade ago... sometime late in December of 2003, the online Pokémon battling simulator Pokémon NetBattle, created and owned by TVsIan and MasamuneXGP, received a download. On that night, the child who downloaded that program logged onto Blue Heaven, by far the most popular server of that simulator at the time, under the name "Dragon Master366". At that instant... a legend was born. On Pokémon NetBattle, there was no such thing as a ladder, like on Pokémon Online and Pokémon Showdown! today. The only way Pokémon battles could be initiated back then was by one trainer issuing a challenge to another, who accepts in response. Although every trainer's challenge window displayed exactly how many Über Pokémon their team contained, this did not stop someone with an UU team from being challenged by someone with a team of Übers. And although the OHKO Clause existed at the time, nothing stopped anyone from challenging someone without the OHKO Clause checked. As such, despite the general consensus back then, the idea that "Übers and one-hit KO moves are banned from standard play" was completely nonsensical at the time. Übers were not banned from any battles whatsoever, while one-hit KO moves were only ever banned in battles in which the OHKO Clause was checked, and no one was ever under the obligation to participate in such a battle in the first place. Yet, given that the statement "Übers and one-hit KO moves are banned from standard play" was the general consensus despite its distance from the truth, one can only imagine how incredibly hated, looked down upon, and disrespected any person who would actually dare to use Übers or one-hit KO moves in their teams would be by the competitive Pokémon community. And as a result of the very fear of what they would face if they were to use Übers or one-hit KO moves, the vast majority of trainers on Pokémon NetBattle, with the exception of newbies who did not know about the social norms and stigmas of the competitive Pokémon community, would never even dare to think of using such. But the legendary trainer who first entered Blue Heaven by the name "Dragon Master366" was an exception. He was a child of unbelievable mental strength, willpower, and ability to believe in himself. Because he recognized the ultimate power that Über Pokémon embody, and knew that Fissure, Horn Drill and Guillotine were by far the best moves in the entire game back in Generation II, the latest generation of Pokémon available on Pokémon NetBattle back then, he persistently used such Pokémon and moves to his heart's content, despite the expectations of the competitive Pokémon community. Furthermore, the Skarmory + Blissey combo, and the use of stall in general was also extremely frowned upon at the time, yet Dragon Master366 used such extensively and repeatedly as well. Needless to say, all of this made him one of the most hated individuals in the competitive Pokémon community, being flamed countless times on Smogon University, GameFAQs, Ignazio's Arena, and Pokémon NetBattle's forums and servers, and the level of hate he received, at the time, was rivaled only by that received by the legendary Generation I trainer and creator of THE Alternative, GGFan. However, while being in such a position would be nothing short of a hellish nightmare for the vast majority of this world's population, it was far from the case for Dragon Master366, for other people's anger, hatred and other negative reactions towards him only served his amusement and nourishment. Additionally, because of the very fact that just about every other person in existence was way too cowardly and foolish to face the hatred and persecutions that come with using Übers, one-hit KO moves and stall teams on Pokémon NetBattle, such people did nothing except placing a limit on their own growth as Pokémon trainers. But Dragon Master366, being the sole trainer to surpass those limits, had access to and could therefore draw moveset and teambuilding ideas from the highest dimension of power within Generation II, which was unavailable to every other trainer due to the weakness that enabled them to be bound by the stigma associated with the use of, ironically, the best, greatest, and most powerful moves of that generation, as well as some of the strongest Pokémon ever. Therefore, thanks to the unparalleled courage and strength that allowed him to keep on believing in himself and using whatever he wanted to use in order to win battles without losing confidence, being demotivated or dragged down despite the harsh flames, insults, and condescending attitudes that he received from just about everyone around him, he managed to become by far the Greatest Pokémon Master to have ever graced Pokémon NetBattle's Generation II metagame, having the glorious and awe-inspiring accomplishment of having a win-loss record of 200-10 on three different servers on Pokémon NetBattle, a win-loss record of 384-17 on the Battledome server, and also managed to become the revolutionary creator of a myriad of unique and trademark Pokémon movesets, such as the Umbreon, Dragonite and Mew movesets LunarLight, Kazeryuu and Luckpwner, respectively. And as he was completely and absolutely justified in referring to himself as the Greatest Pokémon Master, he did so at every opportunity he could find, not in spite of the fact that everyone else would be completely opposed to such a notion, but rather, because of that very fact, as the very thought of being opposed by the entire world while still continuing to believe in himself without caring about the opinions and hatred of those who oppose him gave him an extremely empowering feeling, as it made everyone else look like tiny, insignificant little insects that constantly tried to hunt him down, while he was completely unaffected by their efforts, as he was like a Grand, Immortal Deity who resided high above the heavens, innumerable miles beyond the reach of the Earth on which the lowly insects crawl. Dragon Master366 then kept on winning battles after battles, shredding his way through any trainers who would dare to appear before him with the Horn Drill of his Dragonite, his main signature Pokémon throughout his entire Pokémon battling career, as well as the one-hit KO moves of other Pokémon he used. Throughout the years, as Dragon Master366 grew up, the Greatness of the Pokémon Mastery that he embodied did not fade away, even upon the introduction of Generations III and IV to Pokémon NetBattle and Pokémon NetBattle Supremacy respectively, and neither did his completely invincible and unstoppable nature cease to exist. On the contrary, the aforementioned even grew over time, as later, he began even using two or more Pokémon of the same species in the same team, and even going as far as to using teams containing six of the same Pokémon, including a team of six Rayquaza in Generation III and a team of six Arceus-Normal in Generation IV, despite how incredibly frowned upon doing so was, even though the Species Clause was never officially enforced on Pokémon NetBattle or Pokémon NetBattle Supremacy. And even after becoming one of the two Leaders of Dragon Rush, the strongest clan in the world of competitive Pokémon prior to this clan's fusion with Masters in June 2013 to form Dragon Masters, a position he attained upon his glorious triumph over an incredibly skilled trainer known as Fantomon in the final round of a Generation IV OU tournament on Pokémon NetBattle Supremacy on New Year's Eve at the end of 2009, his lack of hesitation to use whatever he liked in battle without being bound by the norms and stigmas of the competitive Pokémon communities allowed him to serve as an idol whose brilliant light inspired all of his fellow clan members to do the same. Although ladders existed in competitive Pokémon ever since Shoddy Battle was created in 2007, the Great Pokémon Master never used that simulator much, and as such, his very first true laddering experience came with the advent of Pokémon Online in 2010. While he did have his fair share of fun with one-hit KO moves in the GSC OU and DW OU tiers prior to the implementation of the OHKO Clause in those tiers, the eventual implementation of such prevented him from using those moves on the ladder. Although he could still challenge people with one-hit KO moves, he would rather not do so, due to the tendency of people on Pokémon Online to not respond to challenges, as well as the overall difficulty of finding a battle in this way compared to simply laddering. And by the time Pokémon Online came into existence, Übers had already been widely accepted to be an actual metagame, and while some of the stigma associated with the use of Übers still lingered from the Pokémon NetBattle days, the use of Pokémon belonging to that tier was generally, by and large, no longer thought of in a way anywhere close to the way it was back on Pokémon NetBattle. In spite of all that, the Great Pokémon Master's inability to be bound by the expectations of the Pokémon battling community, the very quality of his that allowed him to stand as the strongest trainer ever in past generations as far as Pokémon NetBattle and Pokémon NetBattle Supremacy were concerned, still lived on, in a different, yet similar form. Although the community known as the Smogon University has been studying competitive Pokémon ever since its establishment in December 2004, it has been conducting such research for Generation V far more extensively than for any past generation. But as counter-intuitive as the following may be, the pursuit of knowledge is a double-edged sword. On one hand, such a process may give one knowledge about a certain matter by arriving at a conclusion via experiments, but at the same time, it may lead one towards a wrong conclusion about that matter, which would push one a step back from the position at which they originally started - that is, holding no belief whatsoever about the matter. By the aforementioned principle, the Smogon University has reached a myriad of incorrect conclusions about the competitive aspect of the fifth generation of Pokémon, with such incorrect conclusions often being the general consensus and almost unquestionably believed in by the vast majority of people. But despite the innumerable trainers who have been led along the wrong path in their pursuit of Pokémon Mastery in every metagame within the fifth generation of Pokémon, the Great Pokémon Master once again stood as an exception from the crowd. Upon quitting the Generation V OU tier after witnessing its instability resulting from the frequency of Pokémon being banned from that tier, and therefore heavily shaking up the metagame each time, the Great Pokémon Master found himself a brand new primary metagame: DW Ubers on the Pokémon Online server, later renamed to No Preview Ubers. Rather than taking movesets and strategies from Smogon University and other websites with FAQs, the Great Pokémon Master has always preferred to work things out from first principle, and make his own conclusions about the viability of Pokémon, movesets, teams and strategies in every metagame he plays through his own observations and experiences entirely. He laddered in DW/No Preview Ubers extensively, testing out a massive range of different Pokémon, movesets, teams and strategies, and unlike many other people, he did not seek advice about battling or teambuilding from other trainers, or even attempt to know the general consensus about things in the metagame, knowing that information obtained from such sources were just as likely to be false as they were to be true. Instead, he used whatever he believed to be the best in the metagame based on his own experiences and participated in an unbelievably insane number of battles on the ladder, while gradually making tweaks to his teams by changing EV spreads and Natures, and replacing moves and Pokémon as he discovered weaknesses in his teams through his innumerable first-hand experiences in battle. He later also moved on to Wifi Ubers, achieving the completely insane, god-like and legendary feat of reaching #1 on nineteen different Generation V Übers ladders across six different servers between Pokémon Online and Pokémon Showdown! in the process, and this is not even counting the several times when he reached #1 with more than one name at different points in time on some of those ladders. Along the way, he amassed an absolutely insane amount of knowledge about the Generation V Übers metagame, including some which that were completely unknown and alien to the people at Smogon University as well as just about every other person in existence, mostly due to the fact that such knowledge contradicted many of the incorrect conclusions the people in that community had arrived at beforehand through the double-edged sword embodied by their research. Despite having many of their beliefs about the Übers metagame, such as the unviability of several Pokémon such as Espeon, Reshiram, Lugia and Swords Dance Arceus-Ghost proven completely and utterly wrong immediately in front of their eyes through the very witness of the Great Pokémon Master's success with such Pokémon as mentioned in the previous paragraph, which is absolutely and utterly unparalleled by that of every single Generation V Übers trainer at Smogon University combined despite their refusal to admit such, the members of that community who were considered to be the authorities on the Übers metagame for some reasons persistently preached their incorrect beliefs about the Übers metagame to the other members at that community as well as the guests who visit it and read their articles and analysis. In this way, they placed a limit upon many people's growth as Pokémon trainers, in a way that is different, yet nonetheless strongly reminiscent of the limit the trainers at Pokémon NetBattle placed upon themselves with the cowardice that prevented them from even considering using the best Pokémon and moves in Generation II. And just as the Great Pokémon Master had risen above the rest of the crowd in the past through the courage and power that left him with no hesitation to utilize Übers and one-hit KO moves on Pokémon NetBattle, he had, during his time playing Generation V Übers between 2011 and 2013, also managed the exact same feat once again, this time through the wisdom and therefore extreme ability to believe in himself that prevented him from being deluded by the misinformation about the Übers metagame spread by the Smogon University's community, despite how strongly the people in that community argued their beliefs, as well as the huge number of people in support of such. The Great Pokémon Master's aforementioned courage, wisdom and power, and the vast majority of other people's lack thereof, was what allowed him to gain access to the best Pokémon and moves on Pokémon NetBattle's Generation II, discover the Focus Sash Espeon/support Groudon/Life Orb Ho-Oh team archetype, the ultimate team archetype in the Generation V Übers metagame, as well as stand as the legendary inventor of countless trademark Pokémon movesets, such as the double status Lugia, Yawn Espeon, the SmashPass lead Cloyster, and the SmashPass recipient Kyurem-W, which he would never have even thought of using had he been gullible enough to believe all or most of what the people at Smogon University said. This ultimately allowed him to prove his superiority over every single other trainer in existence on both Pokémon NetBattle as well as the Generation V Übers metagame, as proven through his unsurpassed win-loss records on Pokémon NetBattle, and his nineteen ladder peaks between Pokémon Online and Pokémon Showdown!, respectively. Upon the very sight of such achievements, there was absolutely no doubt whatsoever in the minds of anyone even slightly intelligent, well-informed and rational that he was, in fact, the Ultimate Pokémon Master to have ever walked this Earth. While the inconceivable amount of hatred the competitive Pokémon community directed towards the Great Pokémon Master only ever served to increase his pride and strength, there were times when situations would be more enjoyable for him if he temporarily did not have his notorious reputation, such as when he wanted to enjoy having a normal and sensible conversation with people. At such times, he simply shedded his entire identity and all of the negative reputation attached to it by making a new username, in the same way that a snake sheds its skin in order to remove all of the parasites and imperfections attached to its old skin, and the Great Pokémon Master's tendency and lack of hesitation to shed his identity also served the purpose of allowing him to achieve immortality on various internet forums such as Neoseeker, Smogon University and Pokémon Online, by shedding his forum account and adopting a new one every time it gets banned from posting. Like a snake shedding its skin, like a phoenix rising from the ashes every time it dies, and like a hydra growing back two heads every time it loses one, not only is the Great Pokémon Master's display of immortality and unstoppability far from limited to merely the realm of Pokémon battling, but it is also completely unsurpassed by any other person to have ever graced the competitive Pokémon community, with the exception of the Unbannable Legend, the god-like SmashPass master and Generation V Übers trainer Sasha the Master, the Great Pokémon Master's fellow Leader of the strongest clan in the world of competitive Pokémon, Dragon Masters, the only individual in the history of competitive Pokémon to be hated as much as GGFan and the Great Pokémon Master himself, the only person known to share the Great Pokémon Master's ability to thrive and be empowered by other people's hatred of him, as well as the very man who inspired the Great Pokémon Master to actually use the SmashPass playstyle itself - not in spite of how incredibly frowned upon the use of this strategy is, but rather, exactly because of that very fact. Aside from Sasha the Master, no one in existence shares the same unstoppable personality, as well as the same undying, persistant and unbreakable spirit that the Great Pokémon Master himself possesses. With the Great Pokémon Master's lack of hesitation to use Übers and one-hit KO moves on Pokémon NetBattle in mind, it is easy to see why he enjoyed playing Übers so much not only in Generation V as evident above, but also in Generations II, III and IV before that as well - he loves power, the very concept that the residents of the Übers tier embody. But as of mid-2013, with his aforementioned complete and absolute triumph as the Greatest Pokémon Master and Ultimate Champion over Generation V Übers, participating in battles in that tier, at least in Generation V, has ceased to be enjoyable and satisfying for him anymore. In order to satiate his endless thirst for battle and power, he wanted to be able to control a level of power surpassing even that embodied by the titans of the Übers metagame. But how could he possibly do that, knowing that the Pokémon in that tier are by far the strongest Pokémon in the game? His solution was to turn towards the art of hacking, something practiced by the in-game character Lance of the Elite Four as far back as in Generation I, as a means of allowing even the strongest Pokémon in the Übers tier to gain moves and Abilities they cannot normally have, and therefore reaching levels of evolution that are unseen so far. Back in 2009, the Great Pokémon Master created a server on Pokémon NetBattle Supremacy known as the POKéMON LEAGUE, on which he stood as the sole Administrator and CHAMPION. With the ability to modify the server's database in any way he liked, he granted Dragonite the Ability Huge Power and the moves ExtremeSpeed (which it could not learn at the time) and Flare Blitz, Aerodactyl the Ability Magic Guard and the moves Flare Blitz and Head Smash, and Charizard the Ability Magic Guard and the moves Head Smash and Wood Hammer, and using a team consisting of Gyarados, Dragonite, Dragonite, Aerodactyl, Charizard and Dragonite, he absolutely demolished just about every trainer who dared to challenge him on that server, having achieved a win-loss record of 20-0 in rated battles using that team. Furthermore, having extensively utilized the Missingno. glitch in Generation I to obtain Pokémon above level 100, and used Brainboy, ROM-hacking programs, PokéSav and PokéGen in Generations II, III, IV and V respectively to obtain all sorts of illegal Pokémon, he has already had a brief taste of what the dimension of Hackmons battles was like. Fast forward to 2013, having heard a bit about the Pokémon Showdown! tier Balanced Hackmons from a Smogcast he viewed for fun, the Great Pokémon Master knew immediately that this was destined to serve as his primary metagame for the remainder of Generation V.
After completely mastering this metagame, the Great Pokémon Master then decided to, on the 11th of October 2013, the very day immediately prior to the worldwide release of Pokémon X and Y, which marks the dawn of the Generation VI Pokémon metagame, create a Rate My Team thread on ten different forums - his own Dragon Masters clan forums, as well as the Serebii, Smogon University, Pokémon Online, Pokémon Showdown!, PokéCommunity, PokéBeach, PokéBattleCenter, Ignazio's Arena and Neoseeker forums - for three purposes: to stand in tribute to by far the most successful Balanced Hackmons team he has ever made, Mirages of the Frozen Wasteland; to serve as a grand closure and farewell to his involvement with and Ultimate Championship over the fifth generation of the wonderful game that is competitive Pokémon; and finally, to celebrate the upcoming tenth anniversary of the time he spent participating in competitive Pokémon battles on online Pokémon battling simulators. Aside from being my tenth anniversary Rate My Team thread, this thread, dedicated to the Pokémon Black and White 2 Balanced Hackmons team Mirages of the Frozen Wasteland, is the final installment to the From Burning Fire To Freezing Ice Trilogy, a set of three Generation V Rate My Team threads made by me, with the first two installments being the Pokémon Black and White 1 DW/No Preview Ubers team Flames of the Heavenly Light and the Pokémon Black and White 2 Wifi Ubers team The Blazing Glaciers, respectively. Interestingly enough, despite the fact that this was completely unintentional, Mirages of the Frozen Wasteland happens to contain two Pokémon from the first installment to the trilogy to which it belongs, and one Pokémon from the second installment to that trilogy, or two if one counts the Arceus-Ghost-disguised Arceus-Normal in this team as an Arceus-Ghost. This team also notably features my two favorite Über Pokémon, Kyurem-W and Reshiram, as well as my long-time servants Lugia and Mewtwo, the two Über Pokémon I have used by far the most extensively back in the Generation II days ever since I first started battling on Pokémon NetBattle, which also served as my two signature Pokémon at the time when I achieved my legendary win-loss records on four different servers under the name "Master of DaUniverse" in 2004, and they have, ever since then, been extremely common recurring veterans in the teams I have made in generations after that, and not only is Mirages of the Frozen Wasteland no exception for both of them, but it also marks the very first time they have been united in the same team of mine ever since my Generation III Übers team made in 2006, The Guardians of Heaven's Vacant Throne. Because "Chaosdramon" was the primary name under which I used this team, I decided to give all of my Pokémon nicknames with the word "Chaos" in them, with all of such nicknames being inspired by the names of four characters from Digimon World 2 - the three Chaos Generals ChaosBlackWarGreymon, ChaosMetalSeadramon and ChaosPiedmon, as well as their leader, ChaosLord. Without further ado, I, by far the Greatest Pokémon Master to have ever walked under the heavens, will now present Mirages of the Frozen Wasteland for the entire competitive Pokémon community to see. Because I literally knew close to nothing about the Balanced Hackmons metagame when I first got into it, I decided to enter this tier with a completely hyper offensive mindset. As I knew how incredibly devastating Deoxys-S hyper offensive teams were in Übers, and also knew better than anyone else the unparalleled power of Extreme Killer Arceus in that tier, I started off with a team that utilizes a Turboblaze Deoxys-S lead to Spore the opponent's lead while setting up as many layers of entry hazards on the opponent's team, before proceeding to tear the opponent's team apart with four Attack-boosting Pokémon with access to Same Type Attack Bonus ExtremeSpeed: A Shell Smash Snorlax that also doubles up as the team's Magic Bounce Pokémon, a Lum Berry Belly Drum Slaking with Drought, and two Lum Berry-holding Simple Swords Dance users in Regigigas and Arceus-Normal. Slaking's Drought was not only to serve the purpose of disrupting the strategies of opposing weather teams, but also to boost the power of Sacred Fire, one of the best moves in the entire game, abused by all four physical sweepers in this team. Finally, a Prankster Giratina-A with Haze was put into the team not only to cover up its massive weakness to Fighting-type moves while at the same time possessing the ability to preserve the entry hazards that Deoxys-S sets up, but also because I knew at first glance that it would be by far the best defensive Pokémon in the entire tier, due to its ability to simply erase the stat boosts of any setup sweeper with a +1 priority Haze before getting attacked, combined with its absolutely insane bulk and immunity to by far the most common priority move in the tier, leaving there be almost no chance for Giratina-A to have to be hit by a boosted attack before getting the opportunity to use Haze. 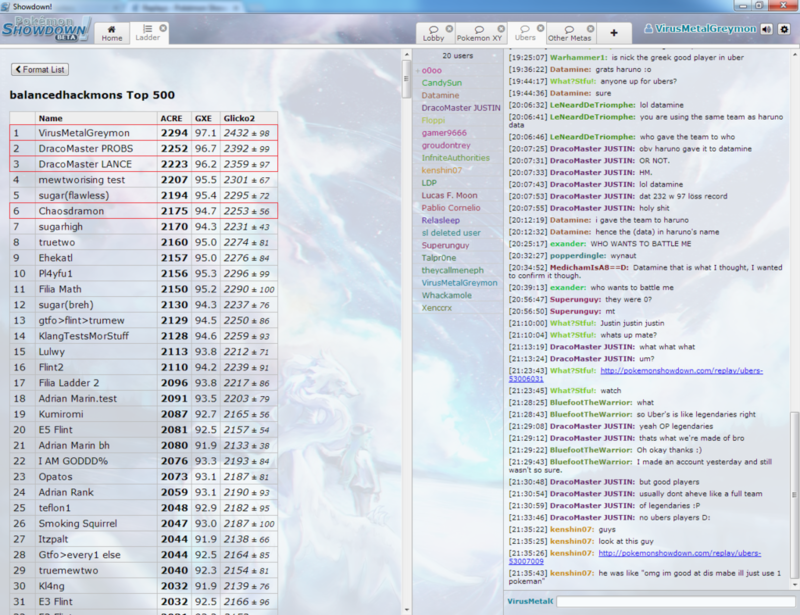 Just like in Übers, Deoxys-S VS. Deoxys-S lead matchups proved to be incredibly frustrating. The possibility of the opponent's Deoxys-S lead having the Ability Prankster or carrying the move Magic Coat or Taunt, as well as the entire issue of Speed-ties made the use of this Pokémon extremely off-putting for me, especially since I knew it was very possible to just sidestep all of these issues by using a Pokémon to anti-lead all variants of Deoxys-S, regardless of what moves they had and whether they had Magic Bounce, Prankster or Mold Breaker/Turboblaze/Teravolt as its Ability. Being inspired by a certain Cloyster set I invented in Übers, I decided to replace the Deoxys-S in this team with a Lum Berry-holding Skill Link Kyurem-B with the moves Icicle Spear, Rapid Spin, Shell Smash and Stealth Rock. While doubling up as the team's Stealth Rock lead and Rapid Spinner, the idea was to have it absorb a Spore thanks to its Lum Berry while boosting with Shell Smash, before outrunning and knocking out the opponent's Deoxys-S on the very next turn with Icicle Spear, a move that also bypasses any potential Focus Sashes Deoxys-S may be holding. As Snorlax was not pulling its weight, I knew that I would be best off replacing it with a different Magic Bounce Pokémon. Having used the Shell Smash + Baton Pass strategy extensively in the Übers tier, I knew exactly how devastating a Dialga can be after a Shell Smash boost, and at some point even imagined how awesome it would have been in that metagame if Dialga itself could use Shell Smash without having to rely on Smeargle, so I decided to make that a reality here by putting a Shell Smash Dialga in the team, with it doubling up as the team's Magic Bounce Pokémon, which was awesome as it was now a set-up sweeper with an immunity to Spore, preventing it from having its sweep stopped by Prankster Spore users. Furthermore, I changed my team's Drought Pokémon from Slaking to Reshiram, as I have noticed that my team needed some immediate firepower, as it struggled immensely against opposing Giratina-A with Haze as well as Unaware walls. As such, Reshiram became the prime choice for Slaking's replacement, due to the immense, immediate destructive power of its Sun-boosted Blue Flare, which it was able to fire off very consistently thanks to the very fact that it also doubled up as the team's weather summoner. The replacement of Slaking with Reshiram also allowed me to move Stealth Rock from Kyurem-B to Reshiram, since Reshiram can easily afford to use this move as its offensive coverage only spans across two attacks anyway, thanks to its completely unresisted Same Type Attack Bonus moves. By freeing up a moveslot on Kyurem-B, this allowed me to give it Close Combat, making it even more dangerous than before. As I found that my team was weak to Contrary abusers, considering my only defensive Pokémon, Giratina-A, was weak to Draco Meteor, I put in an Imposter Chansey over the most replaceable member of the team, Regigigas, in order to stop, and possibly even reverse their sweep. After laddering extremely extensively with the above team, I found out exactly how annoying Sturdy Shedinja can be, especially when I used a team with a suicide hazard lead, as after my Kyurem-B fainted, if my opponent ever decided to Rapid Spin away the Stealth Rock that it set up, I would have no way to take out a Sturdy Shedinja with Lum Berry + Recycle, and the situation was made especially worse by the fact that any Pokémon can learn Rapid Spin in Balanced Hackmons, making it pretty much impossible to block this move with Giratina-A, and this is not even touching on how incredibly common Scrappy Rapid Spin users in this tier are, especially in teams with Shedinja. In response to that situation, I decided to switch the weather utilized by my team from Sun to either Hail or Sandstorm, in order to ensure that any Shedinja that enters the field under such weather conditions would instantly perish. I opted for Hail for three basic reasons: Firstly, from my observation, Sandstorm teams are far, far more common than Hail teams in the Balanced Hackmons metagame, so since my own team did not have any Sandstorm abusers whatsoever, unless Dialga is counted for its mere immunity to that weather condition's residual damage, using Hail over Sandstorm only served to give me a way to disrupt the strategies utilized by opposing Sandstorm teams, by denying them of the 1.5x Special Defense boost for their Rock-type Pokémon, 2x Speed boost of their Sand Rush Pokémon, and other things like that, at the cost of not being able to do so against opposing Hail teams, which from my experience are almost non-existent in the Balanced Hackmons metagame anyway, with the exception of the very team to which this thread pertains to, of course. Secondly, again from my observation, Pokémon immune to Sandstorm are far more common than Pokémon immune to Hail in the Balanced Hackmons metagame, and the number of Pokémon in my team immune to Sandstorm is the same as the number of Pokémon in my team immune to Hail, which means the damage either weather condition would deal to my team would remain the same regardless, so I felt that using Hail over Sandstorm would overall give me a better advantage by being able to deal more residual damage to the opponent's team most of the time. And the third reason why I opted for Hail over Sandstorm was because, by replacing my Kyurem-B lead with a Kyurem-W lead with the exact same moveset but with Snow Warning over Skill Link, Blizzard over Icicle Spear, and Secret Sword over Close Combat, I was able to have a Pokémon that serves the exact same purpose as my Kyurem-B lead, except this one also doubles up as a summoner of Hail, allowing me to free up a spot on my team by having my weather summoner and anti-lead against Deoxys-S being the same Pokémon. In addition to the shifting of the team's weather from Sun to Hail, I also made numerous other drastic changes to the team's structure, in such a way so that it has changed from what originally began as a completely hyper-offensive team to by far the most defensive and stall-oriented team I have made ever since the legendary GSC OU team I created back in 2005, the Supreme Absolute Defense. Firstly I realized that Imposter Chansey was far from a reliable way to deal with Contrary Dragon-type Pokémon, since after it takes some prior damage to be within the KO range of a +2 Draco Meteor, it needs to win a Speed-tie in order to beat them, and this is not even considering the possibility of the opponent's Pokémon holding Choice Scarf, resulting in a near-guaranteed failure for Chansey, something that would result in not only me losing a Pokémon, but the opponent's Contrary Dragon gaining yet another +2 Special Attack boost. This, combined with how devastating opposing Imposters had been whenever they came into my Kyurem-B, Arceus-Normal, or especially my Dialga (as it could hit my Giratina-A super effectively with Spacial Rend, while its Magic Bounce Ability prevented it from being Spored) after they had set up, something which pretty much guaranteed me losing a Pokémon, resulted in me immediately knowing that my team needed an Unaware wall, and I also immediately knew exactly which Pokémon I was going to use for that purpose: the very great wall that had been serving my needs in competitive battles ever since early 2004 in the Generation II days: the Diving Pokémon, Lugia. At this point, the most intuitive move to make would be to put Lugia in place of by far the most unnecessary member of the team, the former weather summoner Reshiram, but other realizations I had come to at this point in time ultimately prevented me from replacing the Vast White Pokémon, at least in its entirety. As Übers was the metagame I played extensively prior to getting into Balanced Hackmons, and I was one of the few Übers trainers to have reached a high enough level of skill and Pokémon Mastery in that metagame to realize that Extreme Killer Arceus was by far the best Pokémon in that metagame, I never imagined the day when I would replace it in my Balanced Hackmons team, especially considering the fact that this Pokémon has even been buffed from the transition from Übers to Balanced Hackmons, with access to the Ability Simple as well as the amazing move Sacred Fire. But with Imposters and Unaware walls running rampant all over this metagame, I eventually realized that Extreme Killer Arceus's True Kingship and Supreme Godhood in the Übers metagame did not even come close to translating in the same way in Balanced Hackmons. Furthermore, now that my team was no longer a Sun team, I couldn't consistently have the power of its Sacred Fire boosted to astonishing levels either, and since my team now contained both of the great walls of Pokémon in Lugia and Giratina-A, I also saw my Arceus-Normal providing very little synergy for my team, as on one hand, my team had two unbelievably bulky pseudo-Hazers, yet instead of taking advantage of that by setting up as many layers of entry hazards as I could, I was using a set-up sweeper that also rarely worked very well against skilled trainers anyway. Because my Dialga suffered the same problems as my Arceus-Normal, combined with the aforementioned fact regarding how incredibly dangerous it could be against my own team if it got Impostered, as well as the ease with which it could be revenge-killed by Prankster Nature Power, I decided to remove it from my team first, and subsequently put Lugia over it. And now that my team did not have a Magic Bounce Pokémon, I decided to move this Ability to my Arceus-Normal while replacing its previously not very useful moveset with a hazard support set with Rapid Spin and Spikes, giving my team excellent hazard control with the aforementioned moves combined with its Ability to reflect the opponent's entry hazards, its reliable recovery, as well as its ability to deal decent damage to by far the most common Spin-blocker in the tier, Giratina-A, with Blizzard, thanks to the fact that this was now a Hail team. Additionally, I also learned that one could disguise their Arceus-Normal as any other Arceus type in Balanced Hackmons, and so I decided to disguise my Arceus-Normal as an Arceus-Ghost, as despite the fact that no skilled trainer would ever be fooled by this, it does help me more against less experienced trainers, who would be put off from exploiting Arceus-Normal's sole weakness, thinking it is actually completely immune to Fighting-type moves. Even though my team was now pretty much a stall team, I didn't want a team with almost no offensive presence either. So I kept Reshiram in my team, only instead of making it a weather summoner, I decided to change its moveset into a Choice Scarf Contrary abuser, which I found to be a far deadlier offensive Pokémon than Shell Smash Dialga or any Simple Swords Dance user, due to its much higher initial firepower, which allows it to overcome even Unaware walls if they switch into its moves after having taken some prior or entry hazard damage, the fact that it can launch an unbelievably powerful attack on the very same turn it sets up, as well as its ability to overcome Imposters either after they have taken a bit of prior damage, or if Reshiram somehow gets to +4 Special Attack before they come in. In addition to being a sweeper, this Reshiram also doubled up as a revenge-killer, which was a great plus to the team. Finally, because my Reshiram no longer knew Stealth Rock, and my Arceus-Ghost-disguised Arceus-Normal now knew Rapid Spin, I replaced Kyurem-W's Rapid Spin with Stealth Rock. And since my Kyurem-W was able to heavily threaten my Unaware wall with Blizzard, as well as my other great wall for that matter, I decided to remove Shell Smash from its moveset in case an Imposter decided to use it against me, and I instead replaced that move with ExtremeSpeed, as that move following a Blizzard is guaranteed to take out any Deoxys-S. Additionally, I have also experienced some annoying situations in which my Kyurem-B/W got a Choice item Tricked onto them by a Deoxys-S lead on the turn they used Shell Smash, something that further put me off from using that move. Upon making the aforementioned massive changes to the team, it then began rising to greatness, as I noticed that after those changes, the number of losses I faced on the ladder decreased extremely significantly. It was also at this time which was when I gave this team's members its nicknames, since "Chaosdramon" was the name I was using at the time, with my Chansey being named "ChaosShadow", something which was fitting for an Imposter in my opinion, and it was also at this time which was when I finally decided to give this team its name, with "Mirages" referring to the deceit that is Chansey's Imposter Ability, the fact that the team's Arceus-Normal is disguised as an Arceus-Ghost, the deceptive speed at which Giratina-A can move with Prankster, as well as the fact that Attack/Special Attack-boosting sweepers that attempt to boost their stats to a high enough level to break through this team's Lugia can be comparable to people who are foolish enough to chase after a mirage, while "the Frozen Wasteland" refers to the state of the battlefield once all of the opponent's Pokémon are reduced to lifeless corpses below the snowy sky summoned by Kyurem-W. However, there was still one thing about this team that I was dissatisfied with: Now that my team contained the metagame's two greatest walls in Lugia and Giratina-A, there was hardly any need for my Chansey to even step onto the battlefield to stop the opponent's sweepers anymore, and as such, I found myself not even using this Pokémon in a great majority of my battles, except for taking a bit of damage when it got buffeted by the Hail every time it was dragged out onto the field by a pseudo-Hazing move. Furthermore, I also found that Pokémon with Mold Breaker/Turboblaze/Teravolt along with Spore were incredibly annoying to my team, so I thought that it would be good to have a Pokémon immune to the Spores of such Pokémon. Because I realized that Chansey was pretty much deadweight against opposing stall teams, as well as the fact that my team was somewhat lacking in physical offensive presence, I turned towards yet another old servant of mine, and invented ChaosGeneral1337, a Poison Heal + Toxic Orb Mewtwo set and one of my proudest creations ever in the long history of my Pokémon battling career, and put it over Chansey in my team, for the purpose of absorbing Mold Breaker/Turboblaze/Teravolt-enhanced Spores, stall-breaking, as well as to serve as an amazing sweeper able to get past Imposters and Unaware walls alike, and this Pokémon was also chosen because I had realized its underwhelming performance in the Generation V Übers metagame contrary to popular opinions, and I wanted to see if this Pokémon was capable of reclaiming its former glory as the world's strongest Pokémon with its unlimited access to moves and Abilities in the Balanced Hackmons tier. And so far, it has yet to disappoint me in this metagame. The mascot Pokémon of the very clan I lead, as well as the star of the second installment to the From Burning Fire To Freezing Ice Trilogy, The Blazing Glaciers, has returned once again to serve me in the Balanced Hackmons metagame as my team's weather summoner, Stealth Rock setter, as well as an excellent anti-lead against all variants of Deoxys-S thanks to its Lum Berry combined with its ability to cleanly finish off Deoxys-S with a combination of Blizzard and ExtremeSpeed. In a tier where Lugia and Giratina-A run rampant, my Kyurem-W, as the wielder of by far the strongest Blizzard in the game, is able to serve as a powerful offensive threat and wall-breaker with its immensely destructive immediate firepower, and assuming its Lum Berry has not been used up previously, it can also serve as an emergency check to Mold Breaker Spore users, if the event does arise in which the opponent sends one out before Mewtwo gets the chance to activate its Toxic Orb. Secret Sword's purpose is to cut down non-Imposter Chansey and Blissey foolish enough to switch into this Kyurem-W, deal decent damage to the incredibly common Sand Stream Pokémon Regirock, Registeel and Ferrothorn without having to rely on Blizzard's 70% accuracy under that weather condition, and also to net surprise KOs against Tyranitar, the one and only commonly-used Pokémon in Balanced Hackmons that is not hit at least neutrally by Mewtwo, one of the two primary sweepers of this team. Aside from serving to anti-lead Deoxys-S, Kyurem-W's ExtremeSpeed can also serve other nifty purposes, such as revenge-killing weakened faster Pokémon, and disrupting certain Prankster + Copycat strategies. Aside from granting the Blizzard of itself and this team's Arceus 100% accuracy, Kyurem-W's Snow Warning Ability provides many great benefits to this team, such as resulting in the instant death of any Shedinja that chooses to stay out in the snow for even a single turn, as well as disrupting the strategies utilized by rain, Sun and Sandstorm teams, which are far more common than Hail teams in the Balanced Hackmons metagame. As Sandstorm teams often try to gain an advantage with that weather condition's residual damage as well as their own Pokémon's immunity to such combined with Leftovers recovery, Snow Warning's ability to essentially deny Sandstorm teams of their Pokémon's Leftovers recovery, or even gradually weaken them if they do not hold such an item, is especially sweet too. This Kyurem-W is given a Special Attack-boosting Nature to guarantee that Deoxys-S faints to a combination of its Blizzard, Hail damage, and ExtremeSpeed, while preserving its Attack and Defense as much as possible, due to this Pokémon's use of the move ExtremeSpeed, as well as the fact that I find its Defense stat to be important for the purpose of tanking Prankster Nature Powers from Pokémon that also know Spore (especially in situations where Arceus is weakened enough to be unable to safely switch into such Pokémon), as well as the physical attacks of Slaking and Regigigas on the turn Kyurem-W weakens them with Blizzard, since the Poison Heal + Spore variants of such Pokémon can be incredibly threatening to this team if they manage to gain momentum. Ever since Lugia first appeared in my Generation II team Universal Mastery, the first of the many teams of mine in which this Pokémon is featured, this massive flying behemoth has played a great range of different roles in my teams, varying from a Curse-using tank and physical sweeper to a double-sided wall to even a Choice Band-abusing wall-breaker at one point. But one fact remains in that never in the past has it ever appeared in possession of an Ability so great that it makes even the Dream World's bestowment of Multiscale upon this Pokémon appear to be insignificant. As the legendary trainer who personally invented four different unique Lugia movesets, including the one in this very team, across three different generations, I have once again employed this Pokémon in Mirages of the Frozen Wasteland. With what many would regard as Lugia's signature trait ever since the generation of its debut, its incredibly huge combination of physical and special bulk combined with access to instant recovery that can be easily abused thanks to its high Speed, the Diving Pokémon returns at my service as the first of this team's two great walls, utilizing its Unaware Ability in combination with its aforementioned signature trait to tank and shrug off even the most destructive attacks of even the most highly stat-boosted setup sweepers the Balanced Hackmons metagame has to offer, from Belly Drum Slaking's +6 ExtremeSpeed to even a +6 Overheat in the Sun from Contrary Reshiram, before proceeding to either put the opponent's Pokémon to sleep with Spore, use Roost in order to heal up while scouting for the metagame's omnipresent Magic Bounce and Magic Coat, or erase all of the opponent's Pokémon's stat boosts with one of its two pseudo-Hazing moves, one of which being used to bypass Magic Bounce and Magic Coat, and the other being to bypass Substitute, a move that is incredibly common on setup sweepers due to Imposters running rampant in the Balanced Hackmons metagame. It is the very presence of Lugia in this team which is why I am able to fearlessly make what would otherwise be reckless moves, such as setting up Stealth Rock or a layer of Spikes with Kyurem-W or Arceus in the face of a Belly Drum, Simple Shell Smash or Simple Tail Glow user on the turn it sets up, as regardless of the degree to which the opponent's Pokémon boosts their offensive stats, they more often than not cannot even hope to threaten the Diving Pokémon as it switches in on the very next turn, regardless of what attacks they attempt to throw at it, and it is also Lugia's very presence in this team which is why it is largely unthreatened by any Contrary abuser (including, of course, any Chansey or Blissey that Imposters my Reshiram), with the possible exception of Kyurem-W.
Just like the team's other great wall, Giratina-A, this Lugia can even singlehandedly destroy the opponent's entire team after their Magic Bounce Pokémon as well any other Pokémon they may have that possesses an immunity to Spore is taken out, by simply putting the opponent's entire team to sleep before proceeding to slowly but surely demolish them all with a combination of its pseudo-Hazing moves, entry hazards, and Hail damage thanks to Generation V's sleep mechanics, or simply by spamming Whirlwind even if there are no entry hazards on the opponent's field if their Pokémon lack Leftovers, something that will surely lead to their demise due to Whirlwind's 100% accuracy (which leaves no chance for the move missing followed by the opponent's Pokémon waking up after a one-turn sleep) combined with the infinite Hail summoned by Kyurem-W. As Lugia is one of the team's three Spore users, I find it to be most beneficial to give this Pokémon a Speed-enhancing Nature to the detriment of the only stat it has no use for, in order to allow it to outrun as many Pokémon as possible so that it can put put them to sleep first. The star of Flames of the Heavenly Light appears in this team as a remnant of the burning fire that the first installment to the trilogy to which this team belongs embodies. It returns once again as a Choice Scarf-bearing revenge-killer, but this time it is defined not by its Ability to completely disregard any defensive Abilities possessed by the opponent's Pokémon, as evident from the fact that Spore is absent from the Vast White Pokémon's moveset, but rather, as one of the deadliest and most frightening stat-boosting sweepers in the entire metagame, whose power increases not on the free turns it finds to set up, but rather simultaneously as it launches its brutally devastating attacks. It is, in my opinion by far the best Contrary abuser in all of Balanced Hackmons, thanks to having Same Type Attack Bonus for not one, but two unbelievably powerful special attacks that raise the user's Special Attack by two levels when used with Contrary, in addition to the infamously completely unresisted nature of Reshiram's Same Type Attack Bonus moves. Although having Same Type Attack Bonus for Draco Meteor is a common sight for most Contrary abusers, the same cannot be said for having Same Type Attack Bonus for Overheat, and such is especially valuable considering this Reshiram holds a Choice Scarf, due the possibility of situations in which the opponent has a Pokémon within the KO range of an Overheat boosted by Same Type Attack Bonus, but not the KO range of an Overheat lacking such a boost, and yet Draco Meteor cannot be used because the opponent has a bulky Steel-type Pokémon in their team. Furthermore, although Mirages of the Frozen Wasteland is not a Sun team, the possibility of abusing the sunlight provided by the opponent's team always remains a possibility, and under such a situation, Reshiram's Same Type Attack Bonus Overheat becomes so staggeringly powerful that it can even overcome the extremely common Unaware walls Lugia and Cresselia in two hits, without the need of entry hazards as well, something that gives Reshiram a further advantage over other Contrary Choice Scarf abusers. And although giving Reshiram an item other than Choice Scarf certainly has numerous advantages, such as allowing it to hold Leftovers or Lum Berry, which is always a plus considering this is a Hail team existing in an extremely Spore-centric metagame, as well as allowing Reshiram to take advantage of its incredible Same Type Attack Bonus V-create, I personally find the revenge-killing power as well as the ability to not have to Speed-tie with most Imposters (both of which it KOs with a single Draco Meteor after reaching +4 Special Attack, or after they have taken sufficient prior damage from entry hazards or otherwise) provided by Choice Scarf's immediate Speed boost to be too valuable to give up. With all of that in mind, the only disadvantage Reshiram possesses compared to other Contrary abusers is its weakness to Nature Power, which is hardly a problem for this team anyway, seeing as Lugia walls any Prankster Groudon, Landorus-T or Rhydon that runs the Swords Dance set, while Arceus walls any of such that runs the Spore set. Superpower is mainly for non-Imposter Chansey and Blissey as well as a move to immediately dispose of Tyranitar, and under rare situations where all of the opponent's remaining Pokémon can be finished off by repeated Superpowers, it becomes the move of choice for Reshiram to use to clean the opponent's team, due to the attack's 100% accuracy. And finally, Sleep Talk allows Reshiram to absorb a Mold Breaker/Turboblaze/Teravolt-enhanced Spore in an emergency, if Mewtwo's Toxic Orb has not been activated yet. Reshiram, along with a Mewtwo whose Toxic Orb has been activated, also notably serves as one of this team's two immunities to Flame Orb Psycho Shift. A Speed-enhancing Nature is given to this Reshiram to ensure that it outruns any Deoxys-A as well as at least Speed-tieing with other Pokémon with base 90 Speed that either hold a Choice Scarf or have reached +1 Speed somehow. Because this Reshiram knows Superpower, lowering its Attack would not be optimal, so its Nature is given to the detriment of its Special Defense, in order to not reduce its lower defensive stat even more, and allow it to tank Groudon's Nature Power from full health in some desperate situations. The second of the team's two great walls. As the one and only Pokémon in Mirages of the Frozen Wasteland to have been a member ever since the original version of the team, this Prankster Giratina-A is arguably the most useful member of the team, due to its supreme bulk that surpasses even that of Lugia's, making it extremely uncommon to find a situation in which it can be KO'd in one hit by an unboosted attack, combined with its Prankster Spore as well as the ability to simply wash away any of the opponent's Pokémon's stat boosts with a simple +1 priority Haze while being completely immune to ExtremeSpeed, leaving there be almost no chance for Giratina-A to be hit by a boosted attack in the first place. Although Giratina-A in normal play has traditionally suffered being stuck with a mediocre Ability as well as having to rely on Rest + Sleep Talk for any form of recovery, which put it at a massive disadvantage compared to its fellow great wall Lugia, the infinite array of moves and Abilities now at its disposal due to the very nature of Balanced Hackmons itself has remedied this problem, allowing it to stand as, in my opinion, the single best wall and overall most useful Pokémon in the Balanced Hackmons metagame, and although many people view the Renegade Pokémon as the premier Magic Bounce Pokémon in Balanced Hackmons, I personally believe that, for such an insanely bulky Pokémon with an immunity to ExtremeSpeed, not using Prankster + Haze on it would be a complete waste, due to the sheer number of setup sweepers it can completely wall, and whose stat boosts it can completely negate in the space of a single turn. Furthermore, having access to a Prankster-enhanced Spore is always a godsend, although one ought to be very careful of Magic Bounce and Magic Coat in general, as well as any potential Lum Berries the opponent's setup sweeper may be holding, especially if they know a move with which they are capable of KO'ing Giratina-A in one hit with whatever stat boosts they have, meaning that, despite how tempting it may be to Spore the opponent's +6 Attack or Special Attack sweeper with this Giratina-A, using Haze instead is usually the safer choice if one does not know the opponent's Pokémon's item. Dragon Tail is a great move for scouting Magic Bounce Pokémon as well as for racking up entry hazard damage on the opponent's team, and speaking of entry hazards, this Giratina-A is, of course, the Pokémon to be used for the purpose of maintaining the entry hazards that Kyurem-W and Arceus set up by blocking any potential (non-Scrappy-enhanced) Rapid Spins, as despite the appearance of this team's Arceus, it is actually not capable of blocking that move. Just like Lugia, this Giratina-A, with access to both Spore and Dragon Tail, can also solo the opponent's team after their Magic Bounce Pokémon as well any other Pokémon they may have that possesses an immunity to Spore is taken out, by putting the opponent's entire team to sleep before proceeding to destroy them with Dragon Tail, possibly accompanied by entry hazard damage. To the detriment of the only stat it does not need, this Giratina-A is given a Special Defense-boosting nature for pretty much only one reason: to allow it to take the rain-boosted Water Spout of the unbelievably threatening Choice Specs Palkia significantly more comfortably. Back in early 2004, I posted a message on TVsIan's now-long-deleted Pokémon NetBattle forums, in which I claimed that I was "the best Mewtwo user." Now, almost a decade later, I have stepped upon the Balanced Hackmons metagame to once again turn that claim into reality, through a unique and trademark Mewtwo moveset I personally invented. With Toxic Orb + Poison Heal, this Mewtwo serves as the team's second immunity to Spore and Flame Orb Psycho Shift, as well its only immunity to Mold Breaker/Turboblaze/Teravolt-enhanced Spores and Toxic Orb Psycho Shifts (which it can absorb regardless of whether or not its Toxic Orb has been activated). While providing defensive synergy to the team in the aforementioned way, the Genetic Pokémon is capable of using the move Spore itself, and not only is it able to abuse this technique to great effect thanks to its blazingly high 130 base Speed which enables to put even Arceus to sleep before the Alpha Pokémon moves, but it is also able to spam this move with far less caution than either Lugia or Giratina-A, thanks to its inability to be put to sleep in the event that this move gets reflected. And on top of that, with a great setup move in Quiver Dance, which it can use freely in the myriad of free turns it can give itself with Spore, combined with its excellent coverage between its frightening signature move that even non-Balanced Hackmons players know and associate with Mewtwo, as well as the devastating secondary move that it borrowed from its teammate Reshiram to hit foes on their opposite defensive stat, and its ability to recover health with Poison Heal especially when combined with, once again, the free turns it gains with Spore, this Mewtwo stands as an unbelievably frightening sweeper. With the ability to Spore Imposter Chansey and Blissey while being unable to be Spored back in return, combined with its recovery from Poison Heal all the while Chansey or Blissey suffer from Hail damage, this Mewtwo can get past Imposters with ease, and with Spore, it can also get past Unaware walls, with the help of some smart double-switching to Kyurem-W and abuse of the Generation V sleep mechanics if the opponent's Unaware wall happens to be Lugia. Having singlehandedly swept countless teams wielded by even the most skilled of trainers, there is now no doubt in mind that, while the success of Dr. Fuji's dream of creating the world's strongest Pokémon may have been shattered with the advent of Arceus in Generation IV, it has now truly reached that state with the help of the new moves and Abilities that Mewtwo gained access to in Balanced Hackmons, combined with my own genius ideas. Although Stored Power can go over Psystrike, I personally prefer the superior firepower of Mewtwo's signature move when it has acquired less than two Quiver Dance boosts, as I find the ability to just send this Mewtwo out to finish off weakened Pokémon, especially if they are immune to Spore, to be exceedingly useful, and additionally, for a sweeper, being able to hit the opponent's Pokémon on both the physical and the special side is always nice. What exactly would either a Balanced Hackmons team or a team that is a part of the From Burning Fire To Freezing Ice Trilogy be in the absence of a Magic Bounce Pokémon? Unlike in normal play, a Magic Bounce Pokémon is considered to be almost a necessity for any decent Balanced Hackmons team, and Mirages of the Frozen Wasteland is no exception, not so much for the purpose of protection against entry hazards, but rather because of how incredibly centralized the metagame is around the move Spore. Aside from discouraging inexperienced trainers from attacking it with Fighting-type moves while encouraging them to waste a turn attacking it with Ghost-type moves, Mirages of the Frozen Wasteland's Arceus-Ghost-disguised Arceus-Normal is the central unit of the team's hazard control, like an extremely buffed up Forretress in normal play. While entry hazards may be almost impossible to reflect consistently in Balanced Hackmons thanks to the fact that literally every Pokémon in the metagame can use Stealth Rock, Spikes and Toxic Spikes, keeping entry hazards off the field, the necessity of which being a defining feature of my battling style ever since the Generation II days, is no more difficult, considering the aforementioned also applies to the move Rapid Spin as well, with this move being almost impossible to block consistently thanks to the fact that literally any Pokémon can use it. With both Rapid Spin and Magic Bounce on an incredibly bulky Pokémon which also happens to be able to hit the most common Ghost-type Pokémon in the metagame, Giratina-A, for decent damage with a super effective, possibly 100% accurate (thanks to Kyurem-W's Snow Warning) Blizzard, this team is very well-protected against entry hazards, and its Arceus can also, in return, attack the opponent's field by setting up Spikes on it, while greatly increasing its own longevity with Recover. Arceus was chosen as this team's Magic Bounce Pokémon due to its lack of weaknesses, and although a Pokémon like Chansey or Blissey may seem more appealing due to their absolutely ridiculous special bulk, Arceus's ability to shrug off Secret Swords from special attackers, combined with the offensive presence that allows it to threaten Giratina-A somewhat, as well as its high 120 base Speed which it often needs to rely on in order to get off a Recover before it is attacked and therefore finished off while weakened are all way too good to pass up. Because of that, a Nature that enhances Arceus's Speed to the detriment of its Attack, which only hinders the power of its Rapid Spin anyway, is chosen. Aside from hazard control and indefinitely walling Pokémon that rely primarily on abusing status moves, this Arceus also counters Prankster Groudon, Landorus-T and Rhydon with Spore, as its supreme bulk combined with Recover allows it to easily shrug off their Nature Powers, and in the case of Landorus-T, it can even deliver a quick, surprise KO against it with Blizzard, and it is also the team's default switch-in to any Chansey or Blissey that Imposters the team's Kyurem-W, Lugia or Giratina-A, due to it being able to reflect Kyurem-W's Stealth Rock while tanking its attacks reasonably well compared to the team's other members, and it also reflects the Spores of Lugia and Giratina-A while fearing little from Dragon Tail. : When my opponent sends out a Giratina-A and I do not know its Ability, my first answer is to go to Arceus, due to its Ability to reflect Spore and entry hazards, which are ubiquitous on Giratina-A, and assault it with Blizzards until I am sure that it does not have Magic Bounce, in which case I can then use it as Spikes bait. If I see Giratina-A using a stat-boosting move, I go to Lugia to pseudo-Haze it out, while if I see a Toxic Orb activating on it, I go to Mewtwo in anticipation of Psycho Shift, and if I see a Flame Orb activating on it, I go to Reshiram in anticipation of Psycho Shift, or Mewtwo assuming its Toxic Orb has already been activated. Once Mewtwo's Toxic Orb has been activated, an event which grants it an immunity to Spore for the rest of the match, it also becomes a viable switch-in to many Giratina-A, which lack the ability to do anything meaningful to it. Kyurem-W and Reshiram also possess the ability to at least damage Giratina-A extremely heavily with Blizzard and Draco Meteor respectively. : The method by which this team deals with Imposter Blissey, of course, depends on which member of the team it Imposters. Out of all the members of Mirages of the Frozen Wasteland Blissey can possibly transform into, the one that is by far the most threatening to this team is Kyurem-W, which is also the biggest reason why this team's Kyurem-W does not know a stat-boosting move. The team's best switch-in to a Kyurem-W-transformed Imposter is Arceus, which can take two Blizzards or Secret Swords from Kyurem-W, while being able to stall it with Recover and reflect its Stealth Rock, and set up Spikes on the free turn Arceus gains in the event that the opponent's Blissey does choose to use Stealth Rock due to not knowing Arceus's Ability. If the situation does arise in which Arceus gets weakened until it is within ExtremeSpeed KO range, the opponent is pretty much guaranteed to use ExtremeSpeed on that turn, and since Kyurem-W's ExtremeSpeed cannot hit Mewtwo very hard, one should switch to Mewtwo on that turn, possibly using that as the opportunity to activate its Toxic Orb, allowing it to freely use Spore on the very next turn, allowing Mewtwo to either set up on Blissey if it chooses to stay in, or force it to switch out, and hopefully it does not get the chance to Imposter Kyurem-W again for the rest of the match. If Blissey happens to Imposter either Lugia or Giratina-A, Arceus is again the Pokémon that one should switch to, due to its immunity to every one of such Pokémon's attacks with the exception of Dragon Tail, from which Arceus takes pathetic damage which can be easily negated by Recover. But staying in with Lugia or Giratina-A and Sporing the opponent's Blissey before pseudo-Hazing it away and taking advantage of Generation V's sleep mechanics is also an excellent option if one predicts the opponent's Blissey using Roost, something that becomes very likely if the opponent's Blissey is low on health, and they already know that this team's Arceus has Magic Bounce. And Sporing the opponent's Blissey is, of course, a completely safe move if Lugia or Giratina-A has already been affected by a status condition. In the event that Blissey Imposters Reshiram, one of two options should be taken depending on the situation. Assuming Reshiram is locked into Draco Meteor, if it is at +4 Special Attack, or if the opponent's Blissey is within the KO range of Reshiram's +2 Draco Meteor, or if Lugia is too weak to switch into a Draco Meteor, Reshiram should simply stay in and blast the opponent's Blissey to oblivion, as the only way for such a plan to fail would be if either Reshiram's Draco Meteor misses, or the opponent's Blissey holds a Choice Scarf and wins the Speed-tie. If any of the above conditions required for Reshiram to KO the opponent's Imposter Blissey is not met, one should switch out to Lugia, whose Unaware Ability allows it to tank Reshiram's attacks indefinitely while either stalling with Roost, putting Reshiram to sleep, pseudo-Hazing it, or a combination of the aforementioned. If Blissey Imposters Mewtwo, then Mewtwo should simply Spore Blissey before Quiver Dancing on the very next turn to ensure that it becomes faster than Blissey by the time it wakes up again, allowing Mewtwo to Spore it again before it moves, unless Blissey spends the turn on which it wakes up using Quiver Dance, of course. Because of the free turns Mewtwo can create for itself with Spore, combined with Blissey's inability to Spore Mewtwo back, as well as the fact that Mewtwo recovers health every turn thanks to Poison Heal while Blissey will be likely to be losing health every turn due to Hail, Mewtwo will overcome its Imposter the vast majority of the time despite its Imposter's far superior bulk. Blue Flare allows Mewtwo to wear down its Imposter, though do note that, assuming neutral weather, Psystrike outpowers it in the event that Blissey acquires two or more Special Defense boosts. But even in the event that an Imposter Blissey somehow defeats the real Mewtwo, such as if Mewtwo starts off the battle at low health, or if Blissey gets lucky with repeated critical hits and/or one-turn sleeps, Unaware Lugia, assuming it is at full health, can take a Spore and survive Blue Flares for long enough to wake up and Spore Blissey back in return, before regaining health with Roost and/or pseudo-Hazing Blissey away. Finally, if Blissey Imposters Arceus, then the safest move to make first would be Blizzard. If the opponent does not know that this team's Arceus has Magic Bounce, they will likely use Spikes first, resulting in that entry hazard being bounced back, prompting the opponent to use Rapid Spin on the next turn. While it may be tempting to switch to Giratina-A in order to preserve that layer of Spikes on the opponent's field, such a move is largely pointless in the long run unless the opponent has more entry hazards than just one layer of Spikes on their field, of course, as that would just result in the opponent's Blissey setting up a layer of Spikes on the turn Giratina-A pseudo-Hazes it away, resulting in the battlefield being even, with both sides having gained a layer of Spikes on their field. If the opponent did not have any entry hazards on their field prior to them setting up a layer of Spikes on themselves, one should switch to Mewtwo while letting the opponent use Rapid Spin, possibly activating Mewtwo's Toxic Orb, and doing so as soon as possible is always beneficial in case the opponent has a Pokémon with Mold Breaker/Turboblaze/Teravolt + Spore. Mewtwo can then easily set up on the opponent's Arceus-transformed Blissey. As for non-Imposter Blissey, they are rarely a problem due to this team's ability to hit them hard with Kyurem-W's Secret Sword, Mewtwo's Psystrike and Reshiram's Superpower, combined with how easily such Blissey tend to serve as entry hazard bait (unless they have Magic Bounce, of course) and set-up bait for Mewtwo, as well as how easily they can be worn down with entry hazards combined with pseudo-Hazing and possibly Spore, as well as being struck by a surprise Secret Sword on the switch by Kyurem-W.
: Pretty much the same thing as Giratina-A, except it is somewhat more difficult to KO due to its neutrality to Reshiram's Draco Meteor and resistance to Mewtwo's Psystrike combined with its ability to outrun Kyurem-W and halve the power it takes from Blizzard by using Roost. But at the same time, it can also be somewhat less annoying thanks to its lack of immunity to Rapid Spin. Any Quiver Dance + Stored Power set is also easily stopped by this team's own Unaware Lugia or Haze Giratina-A. : The vast majority of Deoxys-S in the Balanced Hackmons metagame are leads, and pretty much all Deoxys-S leads regardless of what Ability they possess get destroyed by a Blizzard followed by an ExtremeSpeed from this team's Lum Berry + Snow Warning Kyurem-W lead, the only exception being Deoxys-S with Mold Breaker, Turboblaze or Teravolt that use Trick on the first turn, although even such Deoxys-S would tend to accomplish nothing except for putting Kyurem-W to sleep while getting down a few layers of entry hazards, all of which can be easily removed by Arceus later. As tempting as it may be to switch to Arceus first-turn against a Deoxys-S lead upon seeing that it has neither Mold Breaker, Turboblaze nor Teravolt, doing so runs the risk of having a Choice item Tricked onto Arceus, crippling it for the rest of the match, and having a Choice item Tricked onto Kyurem-W is far less devastating than having such Tricked onto Arceus, which runs a far more defensive set and often has to rely on Recover. If a Deoxys-S lead with neither Mold Breaker, Turboblaze or Teravolt Tricks a Choice item onto Kyurem-W on the turn it takes a Blizzard, one should switch to Arceus on the next turn. If Mirages of the Frozen Wasteland happens to face a Mold Breaker/Turboblaze/Teravolt Deoxys-S that isn't a lead, one should switch to Mewtwo immediately assuming its Toxic Orb has been activated, otherwise one should switch to Reshiram to absorb what will pretty much definitely be a Spore, before using Sleep Talk in hope to nuke the opponent's DNA Pokémon with one of its two massively powerful Same Type Attack Bonus moves. : This team's first response to a Dialga is switching to Arceus, and if it reveals itself to have a setup move such as Shell Smash, Quiver Dance or Shift Gear, Lugia can come in to Whirlwind it away. If Dialga has Magic Bounce, which it commonly has, Lugia can be easily switched in again to Dragon Tail Dialga away. Any Dialga without Magic Bounce or a stat-boosting move is Spikes bait for Arceus, and Magic Bounce Dialga without a stat-boosting move is usually setup bait for Mewtwo, although it would need to find an opportunity to safely come in first, such as on the turn when Dialga heals itself with a recovery move after suffering repeated Blizzards from Arceus. : When the opponent first reveals a Regigigas, it is always best to just Spore or attack it as hard as possible with whatever Pokémon one has out in order to weaken it as much as possible, as while switching to one of the team's two great walls would be greatly beneficial to prevent the team's Kyurem-W, Reshiram or Mewtwo from having to suffering a huge hit, even worse would be to switch to Lugia or Giratina-A, only to find out that the opponent's Regigigas has Poison Heal + Toxic Orb + Spore + Dragon Tail, as such Regigigas can be very difficult to deal with if it succeeds in gaining momentum, and need to be offensively pressured, weakened and KO'd as soon as possible at all costs. Although Giratina-A completely counters most Regigigas that utilize stat-boosting moves, then unless the opponent’s Regigigas has Mold Breaker/Turboblaze/Teravolt of course, Lugia is generally the safer switch-in to it after it has already boosted, because as sweet as it would be to switch a Giratina-A into a +6 ExtremeSpeed before proceeding to use Haze, the possibility of the opponent's Regigigas predicting the Giratina-A switch-in always exists, whereas what move they use against Lugia on the switch, it would almost never deal massive damage thanks to Lugia's Unaware Ability. But generally, provided the opponent's Regigigas does not run the Poison Heal + Toxic Orb + Spore + Dragon Tail set, the inclusion of Lugia + Giratina-A in Mirages of the Frozen Wasteland makes most Regigigas almost a non-threat at all to this team. : Exactly the same thing as Blissey, except it is bulkier, meaning it cannot be destroyed by even a +2 Draco Meteor from the real Reshiram after it Imposters the Vast White Pokémon, although it is also less annoying to Mewtwo, as Chansey tend to hold Eviolite and are therefore less likely than Blissey to carry Lum Berry. : Contrary Mewtwo are easily dealt with by the team's two great walls, even if Mewtwo happens to be able to hit them super effectively. And Mewtwo that run the very set that I invented, which I have noticed to have been increasing in popularity lately, cannot get past my Lugia unless the opponent has a Pokémon such as Kyurem-W in their team which can easily threaten Lugia after it is put to sleep by Mewtwo. I have not faced an opponent with such a team so far. Reshiram can also, of course, revenge-kill any Mewtwo that has not somehow acquired a Speed boost. : Crushed by Hail, Stealth Rock or Spikes. : Pretty much the same thing as Regigigas. : Drizzle Palkia, from my experience, are almost always leads, so since they are always faster than my Kyurem-W, any opponent of mine who uses Drizzle Palkia will never be able to play with their rain during the first few turns, allowing my Arceus to switch safely into even a Choice Specs Draco Meteor, before proceeding to heal with Recover and possibly gain momentum with Spikes, which also serves to weaken the power of Palkia's Water Spout later on in the match. If a Drizzle Palkia switches into one of my Pokémon, I can then switch to either Lugia in anticipation of a Dragon-type move or Giratina-A in anticipation of Water Spout, and either of those two Pokémon can Spore Palkia and pseudo-Haze it away, while Reshiram can come in to revenge-kill Palkia if need be. Choice Specs + Swift Swim Palkia with the support of a teammate with Drizzle can be unbelievably devastating, especially if it manages to predict correctly between Lugia and Giratina-A, but with Lugia's ability to survive even a Choice Specs Water Spout, combined with the fact that Palkia will be locked into this move after using it as well as the fact that the unbelievably bulky Giratina-A as well as Kyurem-W whose Snow Warning removes Palkia's beloved rain both resist this move, this Pokémon can be played around somewhat with prediction, being able to be put to sleep by Giratina-A's Spore before it can even move despite its unbelievably high Speed in the rain, thanks to Giratina-A's Prankster Ability, and given Kyurem-W's immense offensive presence, it can heavily damage a member of the opponent's team on the switch after coming into Palkia's Water Spout, and therefore regain momentum in that way. Either way, if the opponent happens to have a Swift Swim Choice Specs Palkia, a user of Mirages of the Frozen Wasteland should always be prepared to play the rest of their match without their Lugia, as this Pokémon will very often be sacrificed in the midst of the massive destruction that Swift Swim Choice Specs Palkia brings upon this team with its unbelievably devastating Choice Specs and Same Type Attack Bonus-boosted attacks. Despite this Pokémon's sheer wall-breaking power at the start of a match, never before has Mirages of the Frozen Wasteland ever actually been destroyed entirely by one, as this Pokémon becomes exponentially less threatening upon being weakened by entry hazards, being hit by Arceus's Blizzard on the switch, and things like that, and additionally, after firing a Draco Meteor, it also becomes setup bait for this team's unbelievably threatening sweeper Mewtwo. Another highly dangerous variation of Palkia is the Choice Specs + Tinted Lens set, which can heavily damage even Kyurem-W and Giratina-A with its rain-boosted Water Spout thanks to its Ability, but it is somewhat less dangerous than the Swift Swim variant due to its ability to be outrun by Lugia, Reshiram and Mewtwo. Contrary Palkia are walled by Lugia, and finally, Magic Bounce Palkia is also a common sight in the Balanced Hackmons metagame from my experience. Such Palkia generally carry both Rapid Spin as well as a 50% recovery move, allowing Mewtwo to switch into them on the turn they use such moves, with Mewtwo possibly activating its Toxic Orb in the process before proceeding to set up. Such Palkia are also easily revenge-killed by Reshiram as well. Like with all threats, one way to deal with any offensive Palkia is to simply force it to switch out, and then try to set up Mewtwo on a different Pokémon on the opponent's team, so that by the time what would otherwise be an incredibly threatening Palkia is sent out by the opponent, Mewtwo can either survive its devastating attack or outrun it and either put it to sleep with Spore or destroy it with a brutally-boosted Psystrike. : Soul Dew Contrary Latios can be quite troublesome, since it Speed-ties with Lugia while having a chance of KO'ing it with two Draco Meteors, but with two Spore users in this team that are capable of putting Latios to sleep before it gets the chance to move, Hail to weaken the Eon Pokémon gradually, Arceus's Blizzard to weaken it somewhat, as well as Choice Scarf Reshiram to revenge-kill it after it has taken some damage, it is still very manageable. Swift Swim/Chlorophyll/Sand Rush Latios can also be quite threatening, but again, with this team's Prankster + Spore Giratina-A, Arceus's ability to tank its attacks somewhat, as well as Mewtwo's ability to take advantage of Latios's Special Attack drop after firing a Draco Meteor, and use that as an opportunity to set up, it is far from something capable of destroying this entire team on its own, although it is not unlikely to punch some holes in it. : Despite Lugia's Ice weakness, it is the first Pokémon that one should switch to upon seeing a Kyurem-W, due to Contrary being Kyurem-W's most commonly-used Ability in Balanced Hackmons, and although Kyurem-W can hit Lugia for massive damage with its Same Type Attack Bonus Ice-type moves, Lugia can always do things such as using Roost to halve the damage it takes from such moves (while scouting for the opponent's Magic Bounce Pokémon in the process), and using Spore to put Kyurem-W to sleep before pseudo-Hazing it away. Of course, with the possibility of Kyurem-W hitting Lugia with a V-create on the switch before outrunning and KO'ing it with an Ice-type move on the next turn, Kyurem-W remains as a massive threat to this team, but provided one does not get severely outpredicted, and always tries to pressure Kyurem-W offensively as much as possible, it can be stopped. Even if it holds Lum Berry, it still has two chances to be Spored: once by Lugia and again by Giratina-A, before being pseudo-Hazed away. As long as Kyurem-W hasn't acquired any Speed boosts and isn't holding a Choice Scarf (and if it is indeed holding such an item, it becomes much less threatening as it cannot both deal massive damage to Lugia and boost its Special Attack at the same time), it can also be outrun and Spored by Mewtwo, or revenge-killed by Reshiram. : Unless it has Mold Breaker/Turboblaze/Teravolt, Lugia completely and utterly walls any Swords Dance or Belly Drum + ExtremeSpeed Arceus-Normal sets, and assuming Giratina-A has already safely switched into Arceus-Normal, it also indefinitely walls any set unless Arceus-Normal has Scrappy. Defensive Arceus-Normal like the one in my team can be easily stalled out due to this team's defensive nature. : Another incredibly threatening Pokémon, as its Skill Link-enhanced Icicle Spear is capable of the unbelievably amazing feat of felling a full-health Lugia in a single hit with the help of damage provided by, ironically, the Hail summoned by this team's Kyurem-W. Nevertheless, Lugia can still outrun Kyurem-B and Spore it, as likely as it will be that it holds Lum Berry (as even in such an event, Sporing it still comes with the benefit of allowing Giratina-A to put it to sleep later), although Lugia would need to sacrifice itself in doing so if the opponent's Kyurem-B happens to have set up with Shift Gear or Shell Smash before. Giratina-A can also put Kyurem-B to sleep regardless of how many times it has used Shift Gear or Shell Smash and pseudo-Haze it away, although using Haze would be the safer option after putting it to sleep, because if Lugia is already weakened or fainted, a one-turn sleep undergone by the opponent's Kyurem-B would result in the rest of Mirages of the Frozen Wasteland being swept, whereas after using Haze to negate Kyurem-B's stat boosts, if the opponent's Kyurem-B does wake up and KO Giratina-A, Reshiram can then come in to revenge-kill it. : While this Unaware wall may be able to delay Mewtwo's sweep once by tanking its Psystrikes long enough to wake up from Mewtwo's Spore before proceeding to use either Perish Song or a pseudo-Hazing move, it will not be able to do this consistently throughout a match, as all Mewtwo needs to do to get past it is to come in while Shuckle has already been weakened before. Also, with Stealth Rock down, Shuckle cannot switch into Reshiram to wall it either unless a Sandstorm is raging, as outside of that weather condition, it gets KO'd by two Draco Meteors or Overheats after Stealth Rock damage, although the opponent can, of course and by all means, sacrifice a Pokémon to my Reshiram before sending out an Unaware Shuckle to wall it. Shuckle that try to use stat-raising moves + Baton Pass have their plans ruined by Lugia, or, more likely than not, Giratina-A's Haze. : Arceus is the best initial switch-in to it thanks to its Ability to reflect Spore, Leech Seed and entry hazards, as well as its ability to take Gyro Balls quite well and set up Spikes on any Ferrothorn barring Magic Bounce variants. Ferrothorn can also be weakened by repeated Blizzards or Secret Swords from Kyurem-W on the switch, and unless it has Flash Fire, it gets incinerated by Reshiram's Overheat and Mewtwo's Blue Flare, though one should always look out for Prankster Destiny Bonds and Prankster Spores (in Reshiram's case). : Arceus walls any Prankster Groudon with Spore with its supreme bulk and Recover while being able to hit Groudon hard with a super effective Blizzard, and Lugia walls any Prankster Groudon with Swords Dance. Because Prankster Groudon needs Nature Power and a coverage move that is usually Bolt Strike, and almost always use Substitute, they almost never use Swords Dance and Spore on the same set, although even if Mirages of the Frozen Wasteland does happen to face one, this team's Arceus and Lum Berry Kyurem-W can both take a +2 Nature Power while either heavily damaging or outright KO'ing Groudon with Blizzard anyway, and additionally, this team's Prankster Giratina-A can also attempt to Speed-tie with it and Spore it first. Additionally, if Lugia gets Spored, it can also attempt to wake up early and put Groudon to sleep, as it survive a Bolt Strike from Groudon regardless of how many Swords Dances it has accumulated, thanks to Unaware. : Drought Reshiram and Chlorophyll Reshiram are dealt with in pretty much the same way as Drizzle Palkia and Swift Swim Palkia, by forcing them to predict between Lugia and Giratina-A. Choiced Reshiram locked into a Fire-type move also allow this team's own Reshiram to come in and start tearing things apart while at the same time boosting its own Special Attack with Draco Meteor. Contrary Reshiram are generally walled by Lugia, though if it happens to catch Lugia on the switch with a Sun-boosted Overheat, do consider switching to Giratina-A, as that Reshiram holding a Choice Scarf would easily lead to Lugia's demise. : Magic Guard Ho-Oh with Toxic Orb and Spore is another great threat to this team, and the main way to beat it is to weaken it as much as possible with Arceus's Blizzard or Mewtwo's Psystrike before sacrificing one of them, and then finishing Ho-Oh off with Lum Berry Kyurem-W. Assuming Giratina-A does not sleep for too long, it can also tank Ho-Oh's Brave Birds for long enough to wake up in time to force the Rainbow Pokémon out with Dragon Tail, and hope that by the time the opponent's Ho-Oh comes into the battlefield again, it is in the face of a Choice Scarf Reshiram with Special Attack boosts acquired from firing Draco Meteors, or a Mewtwo after it has acquired some Quiver Dance boosts. Although Life Orb Magic Guard Ho-Oh hits significantly harder than Toxic Orb Magic Guard Ho-Oh, it is actually far, far easier for this team to deal with, due to the simple fact that it can be Spored. As for Contrary Ho-Oh, it can be stopped quite comfortably by Giratina-A, as Ho-Oh's non-Same Type Attack Bonus Draco Meteor off its 110 base Special Attack isn't very powerful, while Lugia is only ever truly threatened by Contrary Ho-Oh's V-create under harsh sunlight. : Same as Lugia, except it trades the Blizzard and Stealth Rock weakness for a suspectibility to Spikes as well as an inability to outrun Kyurem-W.
: Lugia and even Giratina-A quite comfortably wall its Contrary set, and Reshiram just outruns and flat-out destroys this Forme of the DNA Pokémon. Just about every Pokémon in this team can beat it one-on-one too, as they are bulky enough to survive a hit from it before KO'ing it in return. : Kyurem-W, Reshiram and Arceus can all hit it hard with Blizzard, Draco Meteor and Blizzard respectively, while the other three members of Mirages of the Frozen Wasteland can Spore it, although one of course must be wary of Prankster Destiny Bond and Magic Bounce. Giratina-O with Mold Breaker/Turboblaze/Teravolt, Spore and Shell Smash can be incredibly threatening if it somehow finds the opportunity to set up, but with how much every member of this team can threaten it, combined with Giratina-A which can always check it even after a Shell Smash with a Prankster-enhanced Spore followed by a Dragon Tail, it will generally not be much of a problem. : The incredibly bad and overrated Mean Look + Skill Swap Normalize Gengar has never, ever, even once succeeded in doing anything meaningful against Mirages of the Frozen Wasteland. Its entire strategy is easily and completely ruined by Arceus, which, upon switching into Gengar, reflects its Mean Look if it chooses to use that move first, while if it chooses to use Skill Swap first, Gengar loses the Normalize Ability, and so Arceus can be switched out to another Pokémon, which therefore won't care about being trapped by Mean Look. Lugia and Giratina-A can both pseudo-Haze Gengar, Kyurem-W and Reshiram can both deal massive damage to Gengar with their attacks, and Mewtwo obliterates it with a single Psystrike. : An Unaware wall that fails to stop this team's Mewtwo, although admittedly, it does an excellent job at walling Reshiram. Its Flame Orb + Magic Guard + Psycho Shift set is easily countered by either Reshiram or Mewtwo after Toxic Orb has been activated. : Despite its very powerful Gyro Ball, it is walled by Arceus, which can also set up Spikes on it, although one has to be cautious of Magic Coat. After entry hazards are up, Lugia and Giratina-A also wall Escavelier and can pseudo-Haze it, forcing it to take damage from entry hazards the next time it comes back in. Unless Escavelier has Flash Fire, which it usually obviously doesn't have thanks to the fact that this Pokémon often has Drizzle or Sand Stream, it can be incinerated by the Fire-type moves of Reshiram and Mewtwo. And finally, any of Giratina-A's moves, Lugia's pseudo-Hazing moves and Kyurem-W's ExtremeSpeed can all disrupt Escavelier's Prankster + Sky Drop + Copycat strategy. : Just like Kyogre, this is an Unaware wall that fails to stop this team's Mewtwo, due to the Genetic Pokémon's access to Spore and Blue Flare, and also obviously cannot take Reshiram's Overheat. : Sand Stream Regirock, by far the most popular Regirock in Balanced Hackmons from my experience, has its entry hazards denied by Arceus, and gets set up on by Mewtwo due to its lack of offensive presence, although one should be very careful of Knock Off if Mewtwo switches in before its Toxic Orb has been activated. It also tends to be weakened by repeated Secret Swords on the switch by Kyurem-W.
: Same as Groudon, except it is harder to deal with using Giratina-A due to the fact that it trolls the Renegade Pokémon by 1 base Speed, but it is much easier to deal with by Arceus, which can threaten to KO it with a single Blizzard, or even completely surprise it with a KO if the opponent did not know beforehand that my Arceus knows that move. : Any Spore or entry hazard-abusing set is countered by Arceus, and any stat-boosting or Baton Pass set is countered by Lugia or Giratina-A.